Started as an indiegogo project, Hover Junkers is an exclusive VR hovering platform shooter game mainly focus on multiplayer FPS action. The game takes place in apocalyptic times. In the game, you fly a ship and need to protect it and yourself against other junkers. The game was also designed for room-scale and has full support for tracked motion controllers. You need to collect loot that you can attach to your ship, get new hand weapons and gear that can help in your survival. 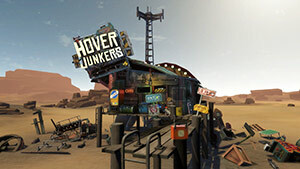 Hover Junkers is one of my favorite VR games right now. The game takes place in apocalyptic times on a dying planet where there are very few resources. It immediately reminds me the movie Mad Max, and I have no doubt that this game was inspired by this movie to some degree. So in the game, you'll be flying a ship. Although the game can be played while sitting or standing, you get the full immersive experience with a room-scale gameplay. The movement of the players fits 1-to-1 to what happens in the game. So for example, if you have a large ship, you need to make sure that you have plenty of room to move around the room while playing. There are several type of ships you can shoot from like the Longboat (long and narrow ship) The Tugboat (small and circular), The Bus, Viktor (fast moving ship with full 360 view with large moving area), The Skiff and others. One in the ship, you have the option to move around in a limited area. You can use the ship movement area to hide, crouch and dodge from incoming attacks. The players can control both the ship movement direction and speed using the motion controllers. I personally really liked the cover system. To cover, you just need to crouch down. Yes, it's simple to do, but I assume that if you do it a lot of time, you probably need to be in shape to hang on for a long period of time. You can place various objects that you collect and place it around you in several places that can help protect you against an incoming fire from different directions. The game features a loot system, where you venture the world to find loot to upgrade your ship and weapons. Some of the loot can be sold to others. 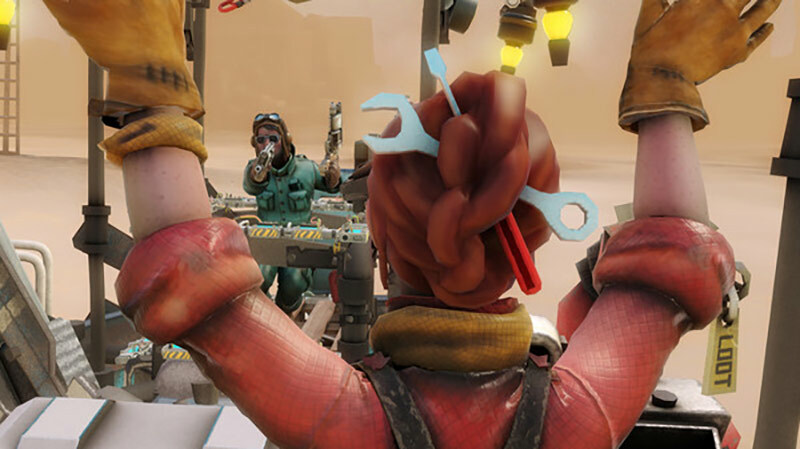 Hover Junkers takes the conventional FPS shooter and brings it to a whole new level. The movement and shooting mechanics and the fact that it plays in room-scale VR make it a completely different and much more immersive experience for every FPS fan out there. I love how the players interacted with each other in the VR space using motion gestures, I love the vivid scenes that the game takes place in, the covering mechanism and the loot system. It's a well-designed space adventure FPS game. It features both competitive and cooperative multiplayer gameplay experience. It seems that everything was thought through to make this game one of the most attractive shooters coming up for VR, specifically for HTC Vive VR headset - Don't miss this one! August 26, 2016Hover Junkers update 1.2.0 brings 8 new weapons, 17 new attachments and much more!